Please visit online shop for original paintings. 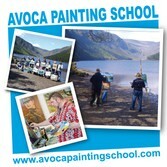 Buy Gift Certificate online at avocagallery.com to redeem in our new Online Shop. Rod will crate and ship it. Rod Coyne's landscape paintings are strongly influenced by past masters such as Claude Monet, William Turner, James Whistler and his namesake Roderick O'Conor. Rod had the fortune to study under contemporary artists and Aosdana members, Barrie Cooke, Gwen O’Dowd and Dermot Seymour. Drawing on these diverse influences Coyne has gone on to create an individual and celebrated style and his paintings grace private and corporate collections, at home and abroad. 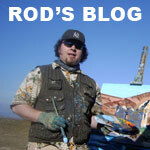 Rod now lives in County Wicklow, Ireland where he founded the Avoca Studio Gallery. plein air on a cliff top..."
Sunday Business Post, May 10th, 2009.